Like the rocks beneath and the vapours above, the waters of the Earth see no reason to stay still. And if you recall the heat engine that drives the atmosphere from the previous chapter, you will soon see the analogies with ocean systems. As with the atmosphere, the best place to start describing the way the oceans circulate is at the Equator, and on the surface. While the relatively stable environment in the deep ocean allows some variation in its composition, the top couple of hundred metres of the ocean are well mixed by the action of winds, tides and currents. This means the surface layer — or mixed layer — is much more homogeneous in its physical properties. Because the ocean is heated from above by the Sun, the mixed layer is hotter than the rest of the ocean, often exceeding 20°C in the tropics. But below’ the mixed layer, at about 200m down, the temperature begins to fall steeply to about 4°C, in a layer known as the thermocline. At the same time, salinity rises from about 3.2 to 3.5 percent before more or less stabilizing below 1000m. This change is called the halocline. Although apparently tiny, it is significant because salinity, along with temperature, affects the density of sea water. As its salinity goes up and its temperature drops, the ocean water increases in density, mainly in a layer charmingly known as the pycnocline. The pycnocline zone extends down to about 1000m, although the exact depth varies from place to place and with the time of year, as the amount of solar energy arriving varies. Because the water above the pycnocline is less dense than that below, it floats on top of it. The importance of this for the circulation of the oceans is that it allows the surface layer to sit on top of the deep ocean and obey its own rules. Atlantic Drift, the water has cooled, and gained in salinity because it has lost water to evaporation and ice formation. It becomes so dense that it sinks and is returned to the Equator deep below the surface. However, some water also returns to the Equator on the surface, down the western coast ot Europe and Atrica, in the Canary Current, and back to the Gulf, via the Northern Equatorial Current. 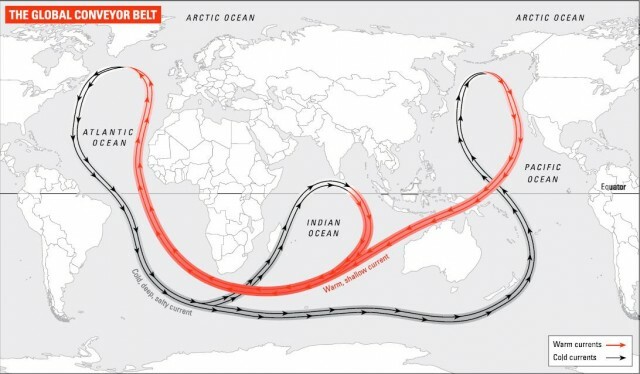 Analogous current gyres — the equivalent of a cell in meteorology — are seen in the north Pacific, where the Kuroshio Current off Japan carries warm water north and the California Current brings it south again. The same picture is repeated in the southern hemisphere. Here the Brazil, Agulhas and East Australia Currents carry warm water southwards in the Atlantic, Indian and south Pacific Oceans respectively and the Benguela, West Australia and Peru Currents bring them back to the tropics. Nearer the poles, things are a little less simple. In the southern hemisphere there is continuous ocean below Africa, Australia and South America in which both winds and waves flow’ non-stop from west to east, while smaller subpolar currents heading the opposite way hug the Antarctic coast. In the north, the Beaufort Gyre, a massive counter-clock-wise current, slowly shifts ice as well as water around the pole, taking about four years to do a lap. It is named after the same Admiral Beaufort as the wind scale we met earlier. But the Arctic Ocean is not a closed system. It is connected to the rest of the worlds oceans by the Transpolar Drift, which is fed by the great rivers of Siberia. It crosses the pole and ends up carrying water down the east coast of Greenland and into the Atlantic. How fast is all this water moving? The fastest, topmost, part of the Gulf Stream can move at 2 metres a second, or 170km a day. This is one of the fastest major currents in the ocean, which means that the water it brings from the Gulf of Mexico is still warmer than the surrounding ocean water when it gets to Europe. Other major ocean currents tend to be slower, those at depth especially so. The deep currents of the oceans are driven in the first instance by gravitation, as water made denser by changes in temperature and salinity sinks through less dense water. The best-described example, as we saw above, is the descent to depth of cold, salty water off Europe after its journey from Florida in the Gulf Stream. The same effect is seen off the coasts of Japan and Antarctica. The water that sinks in this way enters a machine known to science as the Global Conveyor Belt. The amounts of material that the conveyor belt shifts are on a planetary scale. Because it is primarily driven by differences in density determined by temperature and salinity, the Conveyor is also known as the thermohaline circulation. But there are other forces driving it too. The shape of the sea floor and the coastline will affect how currents move. And of course, our old friend M. Coriolis has to be involved — the Earths rotation plays a key role. Lets start where the Gulf Stream left off, where the now-cool water that carried heat from the tropics to western Europe plunges deep into the Atlantic off Norway. This water tracks back to the Equator along the coast of Canada and the US, but does not stop there. Instead it keeps going as a huge undersea river that flows further south, before branching in two. One branch runs round the bottom of Africa into the Indian Ocean, where it warms and rises. The other continues east around the Antarctic before being sucked north into the Pacific Ocean, almost to Alaska, where it wells up and heads back to the Indian Ocean as a warm current. Its a truly global journey, but the conveyor is in no hurry: a complete cycle takes 1000 to 2000 years. The details of this system are still not all known. Indeed, the term Global Conveyor Belt was only coined in the 1980s by Wallace Broecker of Columbia University in the US. But its importance is clear enough. It is the great world equalizer. Without it, the tropics would be hotter and the rest of the world colder. This applies especially to western Europe, which is an estimated 9°C warmer than it would be without the Gulf Stream. Have a look at the map. Newfoundland in Canada is about as far north as London — the one in England — but is a frozen waste, while southern England is temperate. Our new knowledge of this temperature control machine has raised fears that human interference with the climate could change the workings of the Conveyor Belt. Certainly there seems to be less water moving through the Gulf Stream than in the past, although there is probably too little data to confirm any long-term trend. The idea is that global warming could melt the Arctic ice cap, tlood the north Atlantic with light, low-salinity water and prevent that warm Gulf Stream water from keeping Europe in its current balmy state. The notion that humans could affect a system that carries tar more energy than all the world’s power stations put together may seem far-fetched, but it cannot be ruled out. More on that in the last chapter.